Yashiv Construction dba McCullough landscaping is designing and building some of the finest retaining walls in Atlanta and N. Georgia. 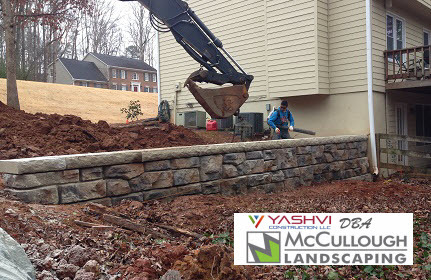 We recently used commercial Redi-Rock blocks to build a residential wall project in Atlanta. Because the incredible weight of these Redi-Rock commercial blocks, we conserved valuable sq. footage in this backyard for our customer by not having to use any geo-grid anchor system. Because this retaining wall was over 25 feet tall, we would have been required to remove dirt ½ the distance behind the wall as the height of wall. That would have required us to install geo-grid behind the wall about 15 feet. This would’ve been a non-starter on this project because this residential retention wall is right on the property line. Which left us very few options. Well, because code allowed us to build 13 courses high with the Redi-Rock blocks… we were able to provide this homeowner with a creative solution, which also became the focal point of their backyard renovation. As shown in the video below, these blocks are really heavy, requiring the use of big machines. This loader was setting blocks that weighed 3290 lbs. and 2439 lbs. Our highly trained crews have done several major roadside construction projects for the Georgia Dept. of Transportation. So we are well trained to take on such a task. But we also do many smaller residential walls designed and constructed with concrete modular retaining wall blocks. Time For New Concrete Modular Block Retaining Wall? If you have an old, rotted railroad tie wall that’s falling down from age and wood deterioration, then it’s time for a new modular block landscape wall, or even a Redi-Rock wall like the one in the video.